Babies..love them! I made a baby blanket using dozens of May Arts Ribbon scraps. Of course, I have a tutorial for you!! Here I am...late again! I've been hard at work on two blog hop projects for May Arts Ribbon and I promise you'll want to participate. We've partnered with a company you know and love so keep watching for it as there will be lots of prizes! In the meantime, I've got two cards for you today. Up first is my very first Rubbernecker Stamps Design Team card for you. Cinderella has nothing on Alice...she's got her own shiny red shoes and an attitude to match! This card is for the CAS Color Challenge on SCS this week to use Red/Black & White...and check it out...it's one layer! She's sporting patent leather shoes, purse and belt as well as shiny buttons, thanks to some Crystal Effects. Oh for the days my waist was that small! Next, is my card for Teapot Tuesday, Tickle a Teapotter Challenge. MMTPT152. We were to bring things with number or things to count for old Mrs. Stump, the grump math teacher. I brought lots of stars...hope she's happy! We're sending our cards to another Teapotter this week chosen by the Mudder, so come and play along! Those stars are supposed to look distressed...they're from the new est.1776 set from Papertrey Ink. Well, here goes! Jumping into my first PTI Blog Hop. I can't wait to be inspired by all the talent out there who participate regularly. This month is a color challenge. Isn't this just the sweetest display for a little princess? I love the fairy tale dresses all in a row so chose those as my colors. I brought in a tiny bit of sparkle by swiping my Quickie Glue pen across the word "Sweet" then sprinkling a bit of Art Institute Angel Dust across it. Not sure if you can see it or not. 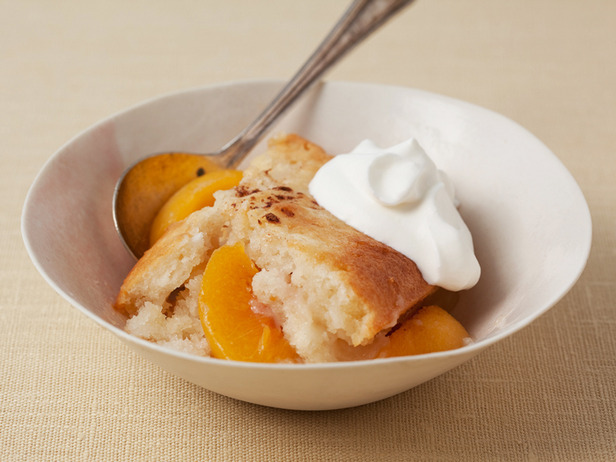 Card size: 5 1/4" x 4"
Foodie Friday - It's all Peaches! In case you were wondering where I've been all week (in addition to being chained to the washing machine and today, the ironing board - Calgon...take me away...ok, I'l settle for ANY excuse to escape!! 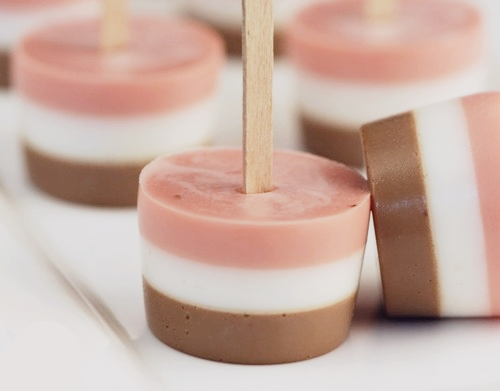 ), I've been freezing these beauties. We didn't have time to pick blackberries this year and gas is too costly for a special trip :-( but hubby did agree to stop on the way home from visiting the grands, to pick up several bushels of these. 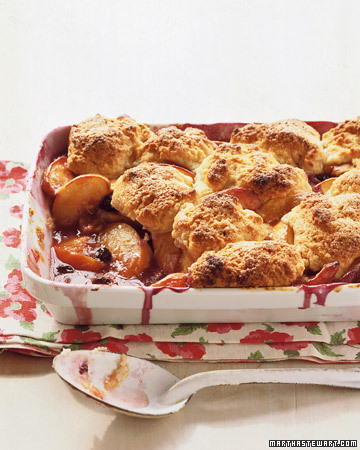 I just ADORE peaches! There's nothing like biting into a fresh juicy peach...the juice running down your fingers, the aroma is like heaven. 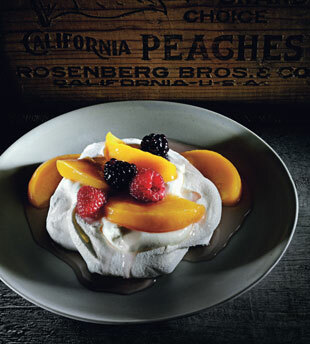 We also love to bless our friends and neighbors with some of the bounty as the peaches we get here in the sub-tropical south have been in cold storage so long and picked green, I'm sure that they are mushy and have no flavor at all. I see Blogger is at it again! I can't add photos unless I directly upload from Picasa so I won't be able to post the Moxie Fab Trigger today. I've spent over an hour trying! This is getting crazy. I will be switching to either Wordpress or Typepad soon, I think. 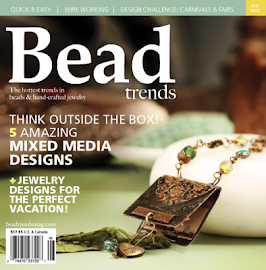 You can find the beautiful Moxie Fab Tuesday Trigger photo here﻿. Bright, happy colors that make the heart sing, "It's summer!!". My little Martha Stewart butterflies are all sparkly thanks to DCWV Citrus Stack. Did I tell you I love that cardstock! 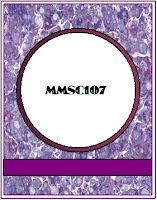 This is also for the CAS124 Challenge at SCS this week to make a tall and thin card. Card size - 5 1/2" x 3 1/4"
It's Wednesday and that means it's time to see what's on the workdesk of the world's stampers at Julia's Stamping Ground - WOYWW 107. Whoo, hoo...I found some more X box storage units for my workdesk. Now my Copics look lonely, don't they? Poor things, maybe they need some new friends! Thanks so much for popping in today. Hope blogger gets it together soon! Back to the Beach Album winner! A real relaxing card that. 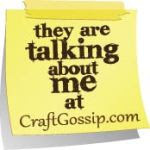 You are a great crafter, Charlene, and am glad to be your follower. Congratulations, Monica! ﻿ Please contact me with your mailing info. It's May Arts/Petaloo week! That means it's bloomin' all over at the May Arts blog and the Petaloo blog! Here's a peek at my project. It's a fun and easy gift for a teacher, office buddy or anyone who might need a little pick me up. There's M&M's involved so you might want to hurry before they're all gone!! You can find the tutorial and supply list at the May Arts Blog. Be sure to comment at the May Arts blog for your chance to win this week. Sometimes life throws us curve balls and sometimes, big ole' Dodge balls. That's the case with this week's Teapot Tuesday Destination - MMTPT151. Sandy Vadas is a friend of a friend. I've never met this brave lady but she's already had to face more in a few years than most of us will in our entire lives. Sandy Vadas is a nurse and works in the Cath Lab. She was married in April of 1991 and in Dec.1991 her husband was diagnosed with Hodgkin’s. They were told they would be unable to have children but Sandy had 2 boys . Between 1992 and 2007, Sandy’s husband had been in and out of remission a number of times, became blind, had a stem cell transplant, had 2 heart attacks and 10 stents. In 2007 he passed away leaving Sandy and the 2 boys. Sandy was diagnosed with breast cancer in 2009, had a bilateral mastectomy and went into remission 06/09 until now. The cancer returned this year in February and she is now receiving Chemo every week. She continues to work full time and loves helping people no matter what the issue! Every year since her husband’s death she has had a fundraiser called Dodge for the Cure. This is a Dodge Ball tournament to help raise money for the Oncology floor at the hospital because she wants to give back to the community. The challenge this week is to make round cards for Sandy in honor of her fundraiser dodge ball tournament. I love the clean shiny white base of this pot and the bright colored buttons so I used SU Glossy white CS for the circle base card, then put the scallop behind the base﻿. I've got a few buttons to straighten, I see! 5501 SE Meadow Springs Blvd. Did you hear? It's May Arts/Petaloo Blog Week! Lots of ribbon and lots of summer bloomers to make your crafty heart happy. 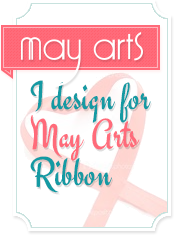 Head on over to the May Arts and Petaloo blogs (they've got even more ribbon and flowers to give away!!) sites to see what the Design Teams have created to get your crafty juices flowing. It's gonna be fun, I promise. Be sure to show all the DT some love...someone's got to win, right? and puppy counsins chewing the same bone...now, that's puppy love! There were so many more precious moments spent with our sons and their families that will remain in our hearts forever. Moments to savor in quiet times. 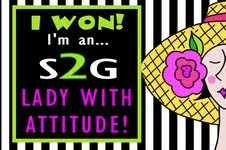 But now....it's time to get back to laundry, ironing, cooking, cleaning, Stamping and a Blog Candy Winner!! Oh, did you remember I always add more than what you see 'cause I love to surprise you? Thanks to everyone who took the time to comment and post the candy on their blog. Now my announcement! I'm honored to say that I've been selected to be on the Rubbernecker Stamps Design Team! Be sure to pop over the RN Blog and welcome the rest of the new DT members. 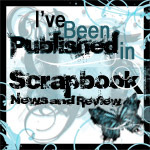 Happy Day...I had a project accepted for publication in Scrapbook News and Review available today, June 12th! Pop on over and see which one it was. This adorable little image & sentiment from Lili of the Valley were a gift from my friend, Sue, of Sue's Stamping Stuff. She's a House Mouse card expert! Our grandson will be 6 on Wednesday and he LOVES soccer. Isn't this little guy just the cutest? I stamped and heat embossed his soccer ball and popped it up on dimensionals. Aren't these just to die for? My cards aren't very cosmopolitan because I was in a vintage mood today; but they are neopolitan. I love those colors! This first card came about because I had the stamps out from the SCS CAS122 challenge - Play on Words. This one isn't intended to be CAS but it's definitely cleaner than the next one. This one is for my girly ballerina. I hope she likes it. She's 8 and this is the first "grown-up" style card I've made her. Little bits of love all clustered together. It's my turn to show you what I created with the cool papers and embellishments plus awesome May Arts ribbon for the May Arts/Creative Imaginations Blog Week. Here's a little sneak peek...the supply list and more photos are on the May Arts Blog. And guess what...they're giving even MORE stuff away just for commenting! Come on over and see what's inside, tell them what you think, then come back here because I'm giving it away!! Just leave a comment, follow my blog if you choose and IF you have a blog...post a pic of the giveaway! I'll give it away on the 21st of June...that's the first day of summer so you'll be all ready to save those beachy memories.